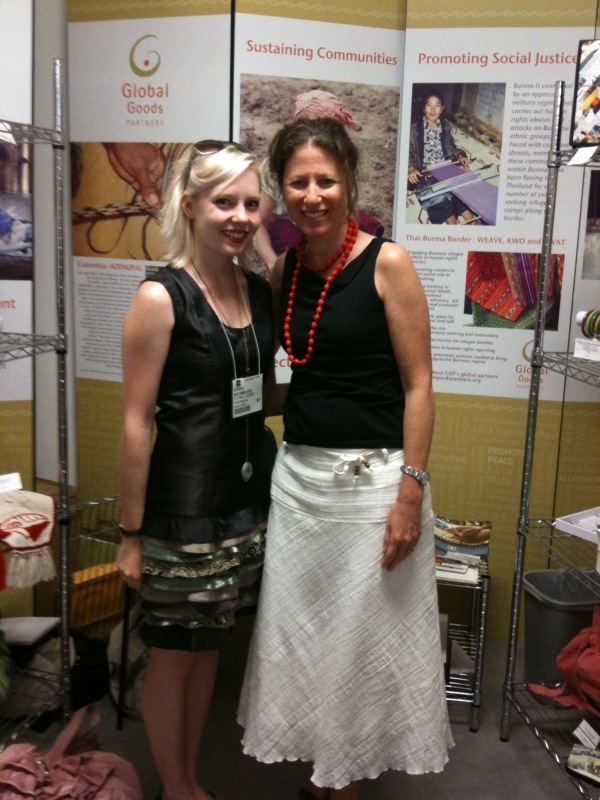 Designer Erika Neumayer Supports Global Goods Partners! Designer Erika Neumayer of Rare selflessly supports Global Goods Partners by donating 10% of sales to GGP. It’s an incredible initiative that stems from her strong belief to give back and help others. We were able to chat with her via Skype to ask a couple of questions about her passions, motivations, and where she plans on going in the future. GGP: Hi Erika! How are you? Erika: Hi! I'm doing well, thanks for this opportunity! GGP: Were you always interested in fashion or was there a particular instance that really opened your eyes to fashion design? Erika: I was always interested in creativity and my hands were always busy making something; sewing was one of my favorite activities. I went to Ghana in 2007, which sparked an intense interest in cultural and traditional dress. This trip shaped the way I think about fashion, art, design, and more. GGP: Wow! What prompted your trip to Ghana? Erika: I was first drawn to Ghana as it was offered from Dominican [University] as a study abroad program. At that time, I was not only taking an African history and culture class, but my advisor—who was a textile fanatic like myself—was going as well. I knew right away that I would learn a lot from the experience. Additionally, my aunt was working for the IRC and was based in Rwanda and Uganda for many years. While I never had the chance to visit her, I always wanted to go to Africa. Everything just seemed to fall into place! GGP: That’s really incredible! It sounds like the trip motivated you to really explore cultural fashions. Erika: Exactly! Their textiles are amazing! Going to Ghana sparked a new passion to research the cultural dress of my own ancestors. GGP: I was just going to ask how you went from Ghanaian traditional clothing to dirndls! [DEF: A dirndl is a type of traditional dress worn in Germany, Austria and other German speaking countries] Erika: Haha…that’s a very good question! Here’s a shortened version of my story: My grandparents were born in former Yugoslavia, but were of German descent. There were many villages through Yugoslavia, Romania, and Hungary that had towns populated by Germans—they were called Danube Swabians. They (Danube Swabians) came to America after WWII and joined organizations to preserve their traditions, including folk dancing. Both of my parents were involved in such organizations; they brought my sister and me to the American Aid Society of German Descendents. We have been dancing with the group since were little kids. When we danced, we would wear dirndls, which are very similar to the traditional German dresses. GGP: That a really interesting connection from Ghana to dirndls! Are you still involved with the American Aid Society of German Descendents? Erika: Yes, but this will be my last year as a dancer. Even though I won’t be dancing, I still plan on participating in event whenever the organization needs my help, especially with costuming! It’s my favorite part. GGP: It seems like your family has always been involved in organizations that give back and help people; do you feel that it’s always been an inherent part of your family upbringing? Erika: Yes! We’ve been volunteering at the organization for a long, long time. My parents taught me to share whatever you can with others. GGP: That’s a great philosophy that certainly fits well with Global Goods Partners! How did you hear about GGP specifically? Erika: My aunt (who worked for IRC) told me about GGP. When I was planning my business, I knew that I needed to find a way to give back. I talked to my aunt about a couple of different charities that would fit my philosophy and personality; GGP was one of her suggestions. GGP allows people to do what I do: create! That’s what I love the most—being creative and helping others do the same. GGP: Your passion for those motives clearly comes through so many elements of your designs. Right in the tagline to “take risks, help others, and be Rare” you include the needs to help others. How do you think all these aspects connect with one another? Erika: I’ve only gotten to where I am today because I took risks. I took a risk going to Ghana, majoring in an art field, and starting my own business. Helping others is something that I try so hard to do, because it makes all the risks I take worth it. Being rare is simple being unique, which is what my mom always told me since I was a kid. It was nicer than telling me I was odd! GGP: Do you have any future travel plans? Perhaps to explore a new culture and their dress? Erika: I don’t have any big travel plans at the moment, but my next collection is inspired by Sci-Fi and Aliens. GGP: Well that’s still quite rare! Erika: I love it! Some of the pieces are very wearable and simple, while others are more creative and avant garde, but it’s a nice blend. Staying new and fresh is the hardest part. 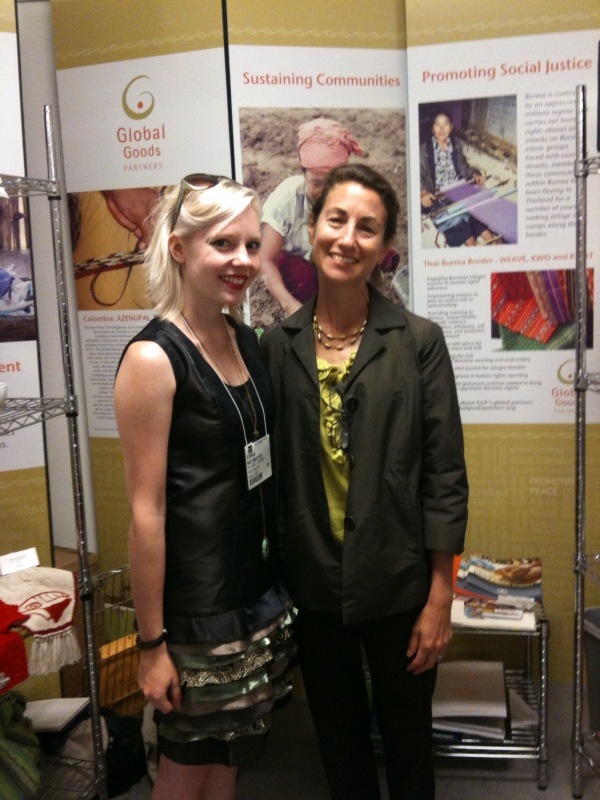 Erika recently met with GGP's co-founders Catherine (above) and Joan (right) at the Beckman's Handcrafted Show in Chicago! For her full bio, please visit her website: http://www.erikaneumayer.com/ You can also look at her inspirational collections on her website.